On the heels of a harrowing EPA lead warning and a mounting health care crisis, hundreds of affected Chicago residents unveiled an urgent reminder today to Mayor Rahm Emanuel to commit to a timeline for the retirement of the city's two notoriously decrepit and toxic Model-T-era coal-fired plants. Calling for an end to the deadly and costly pollution from California-based Edison International's Fisk and Crawford plants on the west side of Chicago, neighborhood families and a broad alliance of supporters with the Chicago Clean Power Coalition posted photos of their affected children, elderly and businesses on a 8-foot-tall exhibit at City Hall. "Right now, residents of Bridgeport, Little Village, and Pilsen are unsafe. They are lacking sanctuary, even inside our churches we are breathing toxic air. Residents of our neighborhoods are suffering so that Edison International can make a profit. That isn't right," said Rev. Thomas R. Gaulke, Pastor at First Lutheran Church of the Trinity in Bridgeport. "We will fight to shut down both Fisk and Crawford coal-fired power plants until our neighbors are truly free of the emissions from the plants. We hope our Mayor will make the closing of these plants his priority. It is definitely ours." 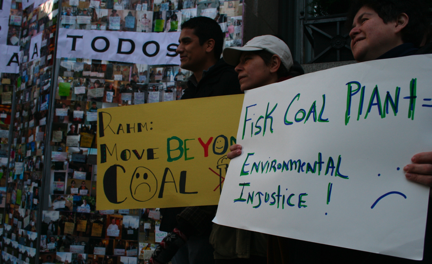 A recent poll showed that Chicago residents overwhelmingly support a move to clamp down on coal-fired plant pollution. 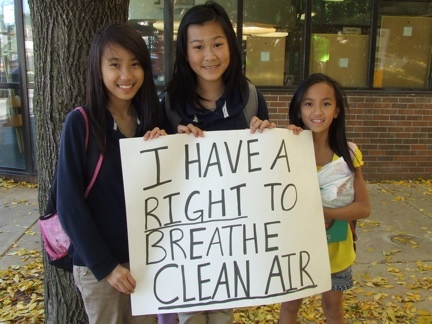 Noting that "state and federal laws addressing air pollution from these plants are inadequate to address this local pollution with local impacts," 49th Ward Alderman Joe Moore and 25th Alderman Danny Solis have sponsored the Chicago Clean Power Ordinance. "Pilsen has a lead emergency and can't wait," Pilsen resident Ruben Franco said. "We hope the mayor flexes his muscles and helps us solve the crisis." Since Mayor Rahm Emanuel's criticism of the two coal-fired plants this summer, hundreds of children and untold numbers of adults have continued to be struck by asthma and heart-related problems connected to the Fisk and Crawford coal-fired plants in the Pilsen and Little Village neighborhoods. Built before the invention of the Model T and operating on equipment from the Eisenhower era, the coal-fired plants have also cost the city an estimated $1 billion in health and environmental damages over the last decade, according to a study last year by the Environmental Law and Policy Center. "Pilsen is a vibrant, working class, immigrant community, but we are plagued by the damaging health effects of the Fisk coal plant. 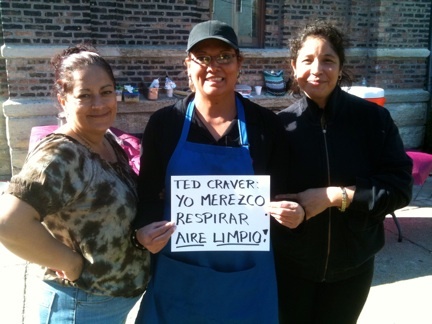 It is time for the plant to go," said Pilsen resident Jerry Mead-Lucero.